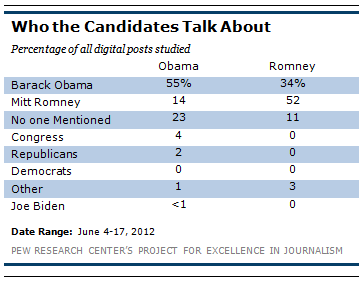 The Pew Project for Excellence in Journalism analyzed the digital activity of the two presidential campaigns over a two-week period in June, and so far, Obama has a wide digital lead over Mitt Romney, according to the study. If an election outcome rested on how well a campaign does with Twitter, then President Barack Obama’s camp would be focused not on November 2012 but January 2013. 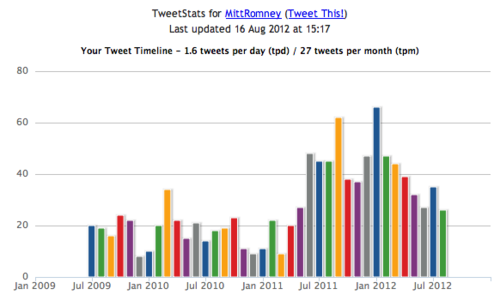 Not only is the Obama campaign out-tweeting the Mitt Romney team, but the Obama tweets are being shared at a rate of 17-to-1 compared with Romney’s. The Pew Project for Excellence in Journalism analyzed the digital activity of the two campaigns over a two-week period in June. The report shows that there is a “digital gap“ between the presumed Republican and Democratic candidates for president, just as there was between Obama and John McCain in 2008. Obama established a broad digital presence in 2008 and has maintained it throughout his presidency. Thus it is not surprising that his digital support dwarfs Romney's." The report reviews candidate activity across a mature set of digital platforms: Facebook, Twitter and YouTube plus the campaign websites. In June, the Obama campaign had a presence on nine social media platforms: Facebook, Flickr, Google+, Instagram, Pinterest, Spotify, Twitter (@BarackObama plus five others), Tumblr and YouTube. The Romney campaign had public accounts on only five: Facebook, Flickr, Google+, Twitter and YouTube; it has subsequently added Tumblr and Spotify, according to the report. For example, on Facebook, today the Obama’s campaign page has almost 28 million likes versus 4.5 million for Romney’s campaign. On Twitter, <a href="https://twitter.com/BarackObama">BarackObama</a> has 18.6 million followers; MittRomney has 863,000. On YouTube, Obama has 210,000 subscribers (214 million views) whereas Romney has almost 15,000 subscribers (18 million views). The Obama campaign is not only active in more spaces, it’s more active, period. Across the platforms analyzed in this report, the Obama campaign posted almost four times as much content as the Romney campaign: There were 614 Obama posts in the two-week period but only 168 posts by Romney. 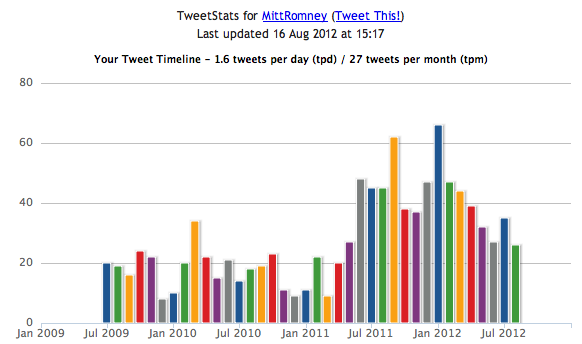 This gap was most evident on Twitter, where <a href="http://twitter.com/BarackObama">BarackObama</a> averaged 17 tweets per day and MittRomney averaged one tweet per day. On Facebook, the campaigns are neck-and-neck. The Obama campaign produces more videos for YouTube and more content for the website blog than the Romney campaign. Analysis of both accounts using Seattle-based Tweetstats makes the point about the Twitter gap visually. But what do the campaigns talk about in these spaces? And to whom? Both campaigns were focused on the economy in June, with 1-in-4 Romney postings and 1-in-5 Obama postings discussing the subject. What differed was the approach. Here are two tweets that illustrate the difference. Not surprisingly, the challenger was more than twice as likely to mention the incumbent than the other way around. In June, Romney’s campaign devoted about a third of its posts to Obama, “largely attacking him for a policy stance or action.” The Obama campaign mentioned Romney half as much. Wordle, a tool used to visualize how frequently words appear in a text, starkly shows this difference. Also, the Romney campaign is much more likely to communicate with an image or a video than the Obama campaign, making an emotional appeal versus a rational appeal. But in the public spaces — YouTube, Twitter and Facebook — neither campaign goes out of its way to actually talk with citizens. The report notes that is rare for either candidate to “reply to, comment on or retweet something from a citizen.” Although if it is going to happen, the odds are that it will be the Obama campaign. 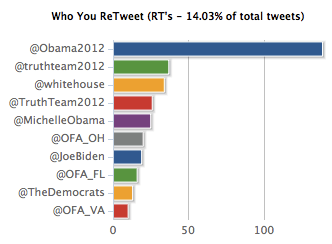 In its analysis of June tweets, the report shows that only 16% of @BarackObama tweets were retweets. Most of those were campaign related; only 3% of all tweets were “retweets of citizen posts.” During the two-week analysis, the Romney camp had one retweet. TweetStats reveals that the June pattern is the norm for both campaigns. 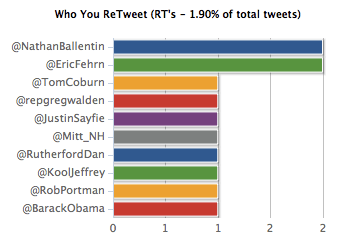 Over the lifetime of the two Twitter accounts, BarackObama shows 14% retweets and MittRomney shows 2%. “These calls to action were most common on the website blog posts. Every single blog post from the Obama campaign during the time studied included some call to action, as did 91% of his YouTube posts. Most, 81%, of Romney’s homepage content and 40% of his YouTube video posts had calls to action as well. Twitter was the platform least likely to contain a call to action,” according to the Pew report. The most popular platform for engagement turns out to be Facebook, not Twitter. The Pew researchers recorded the likes and dislikes (where appropriate), comments, retweets and views for up to 48 hours after posting. The Obama campaign posts on Facebook generated more than 1,100,000 likes. The Romney campaign generated about 635,000 likes, about half as many. 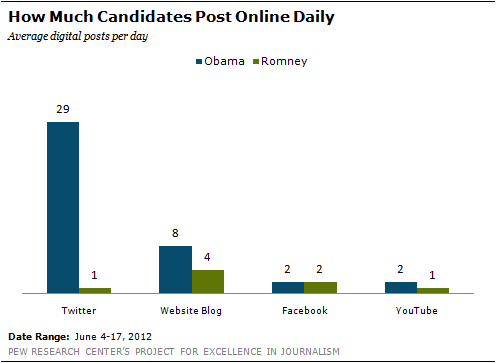 But the Obama campaign posts more often than the Romney campaign, so average likes per post is an important metric. Obama Facebook posts had an average of 2,938 comments per post versus an average of 1,941 for Romney’s. 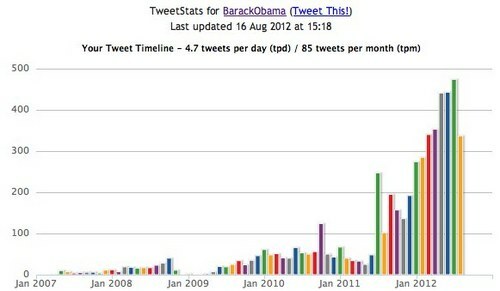 The Obama campaign had more than 150,000 retweets during this two-week period. Romney, on the other hand, had almost 8,600 retweets. However, on Twitter the ratio between the two campaigns matches: 17-to-1 total tweets, 17-to-1 retweets. And the Obama campaign YouTube videos averaged 466 likes per video compared with 253 per video for the Romney campaign. 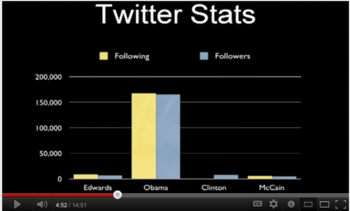 Twitter in the 2008 presidential campaign (slide from January 2009 video). In comparing the 2008 and 2012 campaigns, the Pew researchers ignore Twitter, saying that it “was not in the mix in 2008.” That is not the case. On August 10, 2008, the Obama campaign used Twitter to invite supporters to be among the first to know the pick for vice president. Announcements were made by text and email. By the end of the campaign, Obama’s presence in the emerging network was phenomenal, and 165,000 people had signed up for one-way political advertisements. It may be hard to believe, but in 2008 YouTube was also a new platform for political communication. YouTube gives candidates the opportunity to share longer messages than financially possible on television. And like Facebook and Twitter, it encourages sharing. All campaigns want their videos to “go viral,” to be shared quickly and widely. In the two-week period, the researchers report than no video went viral. Videos for both campaigns averaged about 40,000 views within 48 hours of posting. But the most popular video wasn’t campaign-related but human-related: it was Michelle, Malia and Sasha Obama’s Father’s Day card. Its metrics: 2,265 Facebook shares in the first 48 hours and 211,663 YouTube views. Political digital campaigning truly got its start with the Howard Dean campaign in 2004. Ron Paul’s supporters demonstrated the potential of the medium for fundraising when they contributed more than $4.2 million on November 5, 2007; Paul was polling in the single digits at the time. We’ll not know for a while whether a similar watershed moment for digital political communication came during the Dean, Paul or Obama (first) run for president. But there is no doubt that a generation immersed in digital communication technologies will turn to these tools to learn about candidates and issues. And not just turn to them first; eventually, they’ll turn to them only. @EricEarling alerted me to a critical analysis of the Pew study at BuzzFeed Politics. Vincent Harris argues that Pew looked at the wrong Facebook metrics. He points out that the Romney Facebook page shows more people (1,847,350) “talking about this” than the Obama Facebook page (1,441,696). The Pew study looked at a subset of the “talking about this” dataset. If a person does all of these things over the course of seven days, she is reportedly counted only once; these are supposed to be unique impressions. This means that more people are actually interacting with content on Mitt Romney’s page than Barack Obama’s page despite Obama’s having an almost 7 to 1 advantage in total fans over Romney. Because this metric includes new “likes”, I would argue that it might show that Obama has a more stable base of “fans” (Facebook doesn’t call them that anymore but I don’t have a better word at the moment). If the metric did not include new “likes”, then I would agree that it might be a good public measure of current engagement with content. When the metric rolled out, Beth Kanter asked if the metric was valid or shallow and got a very mixed response from the nonprofit world. These technologies are new and changing. How we (voters) interact with them is evolving. 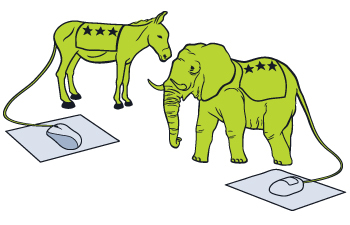 How we (content owners) make assessments about that engagement/interaction is also evolving. The most important thing we can do, I think, is to try to move beyond popularity contest numbers (number of likes, number of followers) — something Pew tried to do. Finally, remember that the key metrics — the ones that help any page owner figure out if she is helping her fans/visitors make the world a better place — are visible only to page administrators.